Tony Blair delivered a major speech on April 23 entitled, "Why the Middle East Matters". In summary, he argued that the Middle East, far from being a "vast unfathomable mess" is deep in the throes of a multi-faceted struggle between a specific religious ideology on the one hand, and those who want to embrace the modern world on the other. Furthermore, the West, blinded up until now as to the religious nature of the conflict, must take sides: it should support those who stand on the side of open-minded pluralistic societies, and combat those who wish to create intolerant theocracies. He states that a 'defining challenge of our time' is a religious ideology which he calls 'Islamist', although he is not comfortable with this label because he prefers to distance himself from any implication that this ideology can be equated with Islam itself. He worries that "you can appear to elide those who support the Islamist ideology with all Muslims." He rejects Western non-religious explanations for the problems caused by Islamist ideology, including the preference of "Western commentators" to attribute the manifestations of Islamism to "disparate" causes which have nothing to do with religion. Likewise he implies that the protracted conflict over Israel-Palestine is not the cause of this ideology, but rather the converse is the case: dealing with the wider impact of Islamist ideology could help solve the Israel-Palestinian conflict. According to Blair, what distinguishes violent terrorists from seemingly non-violent Islamists – such as the Muslim Brotherhood – is simply "a difference of view as to how to achieve the goals of Islamism", so attempts to draw a distinction between political Islamist movements and radical terrorist groups are mistaken. Blair considers that the religious ideology of certain groups like the Brotherhood, which may appear to be law-abiding, "inevitably creates the soil" in which religio-political violence is nurtured. He considers "Islamism" to be a major threat everywhere in the world, including increasingly within Western nations. The "challenge" of Islamism is "growing" and "spreading across the world" and it is "the biggest threat to global security of the early 21st Century." 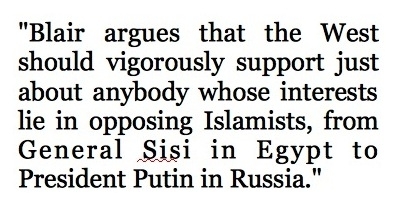 Because of the seriousness of the threat of this religio-political ideology, Blair argues that the West should vigorously support just about anybody whose interests lie in opposing Islamists, from General Sisi in Egypt to President Putin in Russia. He finds it to be an absurd irony that Western governments form intimate alliances with nations whose educational and civic institutions promote this ideology: an obvious example of this would be the US – Saudi alliance. In all this, one might be forgiven for thinking that Blair sounds a lot like Geert Wilders, except that, as he takes pains to emphasize, he emphatically rejects equating Islamism with Islam. Tony Blair and Geert Wilders agree that there is a serious religious ideological challenge facing the world, but they disagree on whether that challenge is Islam itself.My Blair's speech is aimed at people who do not wish to be thought of as anti-Musilm, but who need to be awakened to the religious nature of the Islamist challenge. He is keen to assure his intended audience that if they adopt his thesis they would not be guilty of conflating those who support radical Jihadi violence with all Muslims. Two key assumptions underpin Blair's dissociation of Islamism the religio-political ideology from Islam the religion. First, Blair presupposes that Islamism is not "the proper teaching of Islam". It may, he concedes, be "an interpretation", but it is a false one, a "perversion" of the religion, which "distorts and warps Islam's true message." He offers two arguments to support this theological insight.One is that there are pious Muslims who agree with him: "Many of those totally opposed to the Islamist ideology are absolutely devout Muslims." Blair's other argument in support of his belief that Islamism is a perversion of Islam is an allegation that Christians used to hold similarly abhorrent theologies: "There used to be such interpretations of Christianity which took us years to eradicate from our mainstream politics." This is a self-deprecating variant of the tu quoque logical fallacy, in which another's argument is attacked by accusing them of hypocrisy. Here Blair rhetorically directs the ad hominem attack against himself and his culture. In essence, he is saying "It would hypocritical of us to regard Islamist ideology as genuinely Islamic, because (we) Christians used to support similarly pernicious theologies in the past (although we do not do so today)." Blair's second key assumption is a widely-held view about the root cause of "the challenge". The fundamental issue, he argues, is people of faith who believe they and only they are right and do not accept the validity of other views. Such people believe that "there is one proper religion and one proper view of it, and that this view should, exclusively, determine the nature of society and the political economy." "It is not about a competing view of how society or politics should be governed within a common space where you accept other views are equally valid. It is exclusivist in nature." Hilary Clinton has expressed a very similar understanding of extremist religionists, who "define religion in such a way that if you do not believe what they want you to believe, then what you are doing is not practicing religion, because there is only one definition of religion." Such views about religion may reflect the secularist Zeitgeist, but they offer a very weak explanation for the challenge of radical Islam. The problem is not that Islamists believe they and only they are right. The problem is all the rest of what they believe.Consider this: Tony Blair himself believes his goal is valid, true and worth fighting for, namely a tolerant, open, democratic society, and the Islamists' goal of a sharia society is invalid. He does believe that his view should determine the nature of society. Likewise many religious groups believe that they follow the one true religion, including the Catholic Church, which Tony Blair formally joined in 2007: Mother Theresa of Calcutta certainly did not consider alternative religious views equally valid to Catholic dogma. But none of this certainty of belief implies that Tony Blair or Catholics in general are disposed to become terrorists, cut hands off thieves or kill apostates. Blair's argument manifests the paradox of tolerance. His vision of a good society is one in which people must respect the views of others as "equally valid". At the same time he argues that we should disallow and combat Islamism because it is "perverse". He is asking for Islamism not to be tolerated because it is intolerant. If Blair's explanation for Islamist nastiness is flawed, what then is the explanation? This takes us back to Islam itself. Does Blair's position on Islam hold water? Blair's arguments for his positive view of Islam are weak. The validity of Islamism does not rest or fall on whether there are pious Muslims who accept or reject it, nor on whether Christians have advocating equally perverse theologies in the past. In the end, Islam as a religion – all mainstream Muslim scholars would agree – is based upon the teachings of the Sunna (the example and teaching of Muhammad) and the Koran. Islam's religious validity in the eyes of its followers stands and falls on how well it can be justified from those authorities.There are at least three respects in which Islamist ideologies claim strong support from Islam – that is, from the Koran and Muhammad. One is the intolerance and violence in the Islamic canon. The Koran states "Kill them / the polytheists wherever you can find them (Sura 9:5, 2:191). Muhammad, according to Islamic tradition, said "I have been sent with a sword in my hand to command people to worship Allah and associate no partners with him. I command you to belittle and subjugate those who disobey me …" He also said to his followers in Medina, "Kill any Jew who falls into your power." Following in Muhammad's footsteps, one of Muhammad's most revered companions and successors as leader of the Muslim community, the Caliph Umar, called upon the armies of Islam to fight non-Muslims until they surrender or convert, saying "If they refuse this, it is the sword without leniency." It will not do, in the face of many such statements found in the Koran and the traditions of Muhammad, to throw one's hands up in the air and say there are also bad verses in the Bible. If Jesus Christ had said such things as Muhammad did, Christianity's political theology would look very different today and medieval Christian Holy War theology – developed initially in response to the Islamic jihad – would have come into being as part of the birth-pangs of the religion, just as the doctrine of the Islamic jihad did in the history of Islam. Islamist apologists find it relatively easy to win young Muslims over to their cause precisely because they have strong arguments at their disposal from the Koran and Muhammad's example and teaching. Their threatening ideology is growing in influence because it is so readily supported by substantial religious foundations. Islamism may not be the only interpretation of Islam, but by any objective measure, it is open for Muslims to hold it, given what what is in their canon. Blair makes a telling over-generalisation when he states that Islamist ideology is an export from the Middle East. Another important source has been the Indian sub-continent. Today Pakistanis today are among the most dynamic apologists for Islamism. Abul A'la Maududi, an Indian (later Pakistani) Islamic teacher and founder of Jamaat-e-Islami was writing powerful texts to radicalise Muslims more than 70 years ago – including his tract Jihad in Islam (first published in 1927). His works remain in widespread use as tools of radicalization by Islamist organisations. Maududi's theological vision was driven, not by Middle Eastern influences or Saudi petrodollars, but by his life-long study of the Koran and the example of Muhammad. The spiritual DNA of Maududi's Islamist theology was derived from the Islamic canon itself. 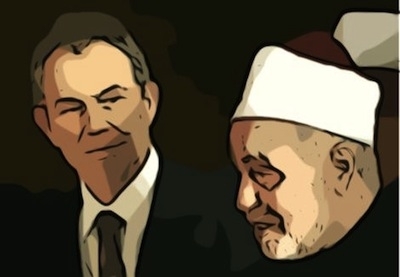 The second point to understand about Islamist ideologies is that the conflation of politics and religion, which is one of Blair's main objections to Islamism, has always been accepted as normative by the mainstream of Islamic theology. It is orthodox Islam. As Bernard Lewis pointed out, the separation of church and state has been derided by most Muslim thinkers since the origins of Islam: "Separation of church and state was derided in the past by Muslims when they said this is a Christian remedy for a Christian disease. It doesn't apply to us or to our world." The third point about Islamist ideologies is that their vision of a closed society in which non-Muslims are second-class participants is in lock-step with the conservative mainstream of Islamic thought. Here again Bernard Lewis: "It is only very recently that some defenders of Islam began to assert that their society in the past accorded equal status to non-Muslims. No such claim is made by spokesmen for resurgent Islam, and historically there is no doubt that they are right. Traditional Islamic societies neither accorded such equality nor pretended that they were so doing. Indeed, in the old order, this would have been regarded not as a merit but as a dereliction of duty. How could one accord the same treatment to those who follow the true faith and those who willfully reject it? This would be a theological as well as a logical absurdity." (The Jews of Islam, Princeton University Press, 1987, p.4). Tony Blair is right to call the world to engage with and reject radical Islamist ideology. This is a defining global challenge of our time. He is also correct to affirm that this ideology is religious. But he is profoundly mistaken to characterize it as un-Islamic. The fallacious arguments he puts forward for distinguishing Islam from Islamism are nothing but flimsy rhetoric. The hard evidence against separating Islamism from Islam is clear, the sentiments of some pious Muslims non-withstanding. Blair is right to call for the West to combat "radical Islam", but the reason why "radical" is a correct term to use for this ideology is that radical means "of the root," and Islamist ideas are deeply rooted in Islam itself. Islamism is a radical form of Islam. This explains why the radicalization project has been advancing with such force all over the world. When countering radical Islamic ideologies, Western leaders should refrain from putting themselves forward as experts on theology, who are somehow competent to rule on whether a particular interpretation of Islam is valid or "perverse". There is something ridiculous about secular politicians ruling on which manifestations of Islam are to be judged theologically correct. As Taliban Cleric Abu Qutada once said, "I am astonished by President Bush when he claims there is nothing in the Quran that justifies jihad violence in the name of Islam. Is he some kind of Islamic scholar? Has he ever actually read the Quran?" In this post-secular world, our leaders need to "do God" with less naivety. They need to grasp that the inner pressure they feel to manifest respect for Islam whenever they object to some of its manifestations is itself a symptom of the ideology of dominance which powers the Islamist agenda. They should resist the pressure to mount an apology for Islam. The mullahs can do that. Mark Durie is a theologian, human rights activist, pastor of an Anglican church, and an Associate Fellow at the Middle Eastern Forum. He has published many articles and books on the language and culture of the Acehnese, Christian-Muslim relations and religious freedom. A graduate of the Australian National University and the Australian College of Theology, he has held visiting appointments at the University of Leiden, MIT, UCLA and Stanford, and was elected a Fellow of the Australian Academy of the Humanities in 1992.